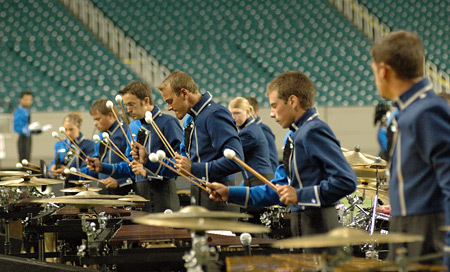 The Bluecoats are pleased to announce that the corps' battery percussion section and front ensemble have been chosen to perform a featured educational clinic at the 2007 Percussive Arts Society International Convention (PASIC) in Columbus, Ohio. The clinic, titled "Digital and Acoustic Alchemy for the Modern Percussion Ensemble," will be held in the main ballroom of the Columbus Convention Center at noon on Saturday, Nov. 3. "Digital Aerobics" is a fun way of using digital technology to rehearse the ensemble more efficiently. The Bluecoats will show the audience a mobile electronics setup to help take their rehearsal etiquette to the next level. "The clinic will not only touch on using digital technology to rehearse, but also on the Bluecoats' equipment and approach to our 2007 production 'Criminal,'" said Michael McIntosh, Bluecoats battery percussion arranger and music coordinator. The corps' management, percussion staff, and members are very excited about this opportunity for the Bluecoats to be represented at the highest level. "We could not be more proud of our percussion ensemble, and we are very excited about participating in PASIC this year," said Bluecoats Executive Director David Glasgow. Download print materials and more info about this clinic on Bluecoats.com.